In January we created Minecraft pictures as part of our learning about measurement and area. We also planned a tropical theme day and participated in Festival Du Voyageur games outside. Our most memorable experience was making bannock with Room 28. 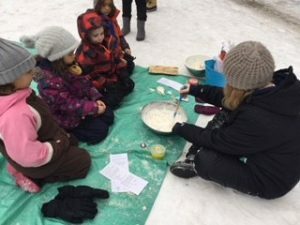 We loved making bannock outside in the snow and baking it in the fire. The bannock tasted REALLY good and we enjoyed eating it. Do you know what’s funny? 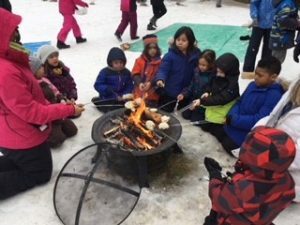 The snow was so cold, but the bannock made us feel warm. We appreciated the helpers outside because without them we would not have been able to make bannock. 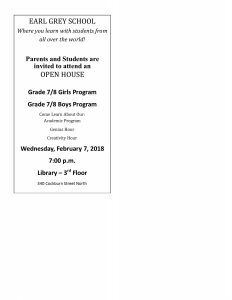 It was a nice celebration and we hope we can make bannock again. Room 12 Had a Great Month! 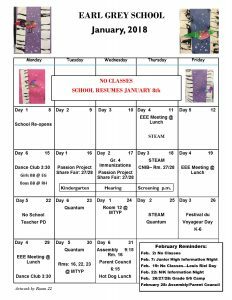 During the month of January, we have been really busy. 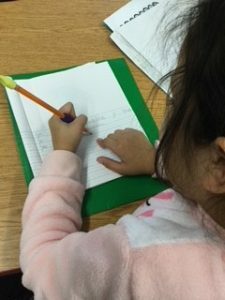 We have been reading and writing a lot in both Spanish and English. In math, we finished our subtraction unit and started our 2D unit. 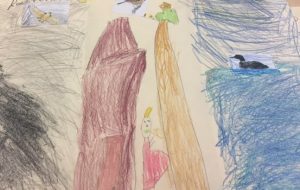 We have been adding to our penguin inquiry project little by little. 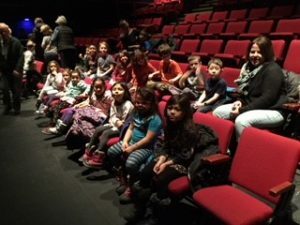 We had a great time at MTYP watching the play “The Lion, The Witch and The Wardrobe.” We made Bannock and participated in the Festival Du Voyageur games. What a great month! Durante el mes de enero, hemos estado muy ocupados. Hemos estado leyendo y escribiendo mucho en español e inglés. En matemáticas, terminamos nuestra unidad de sustracción y comenzamos nuestra unidad de formas 2D. Hemos estado agregando poco a poco a nuestro proyecto de investigación de pingüinos. Nos lo pasamos genial en MTYP viendo la obra “The Lion, The Witch and The Wardrobe”. 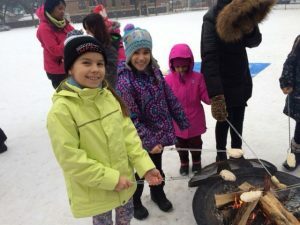 Hicimos Bannock y participamos en los juegos del Festival Du Voyageur. ¡Qué gran mes! Birds have different kinds of feathers such as, tail feathers, cover feathers, flight feathers and down feathers. Owls grow flight feathers when they are fledglings. That is when they learn to fly. 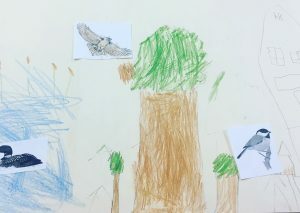 Birds eat different things such as, worms, smaller birds, eggs, fish, seeds, nuts. Not all birds are good at flying. Penguins, ostriches and chickens don’t fly. Raptor birds like hawks, eagles, owls and falcons need to live high in a tree, or on a rocky cliff so they can look down on their prey. They swoop down on their prey. Owls like to eat rats, mice and other small animals. Then they throw up something called a pellet which has bones and fur that the owl cannot digest. 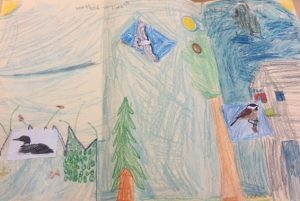 Birds like Canada Geese, loons and ducks live in wetlands. They make their nests in the grasses surrounding the wetland. Some birds migrate from north to south in the winter because they don’t like the cold and it’s difficult to find food. Every bird starts off as an egg. Birds are oviparous. Baby birds are called chicks. When owls grow a bit more and begin to change they are called owlets. When they begin to fly they are known as fledglings. Finally, they become adults. 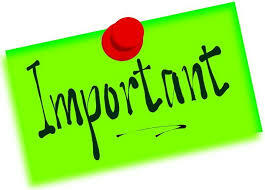 ELA Exam Part 1 – June 12 a.m.
ELA Exam Part 2 – June 13 a.m.
Science – June 15 a.m. 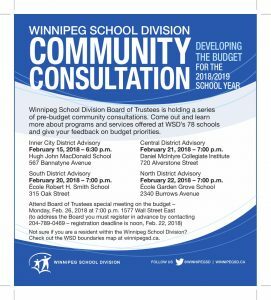 Math – June 19 a.m.
Social Studies – June 20 p.m.